FABULOUS HOME & NEIGHBORHOOD! 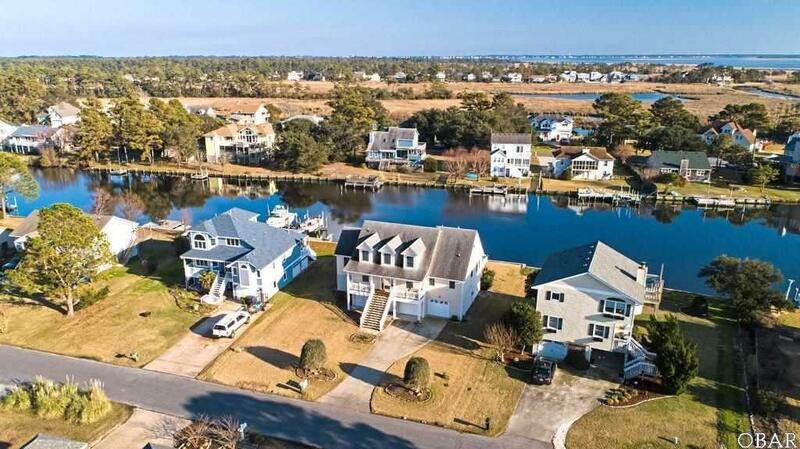 * A BOATERS PARADISE ... OR YOU WILL LOVE IT IF YOU JUST LIKE TO BE NEAR OR ON THE WATER! 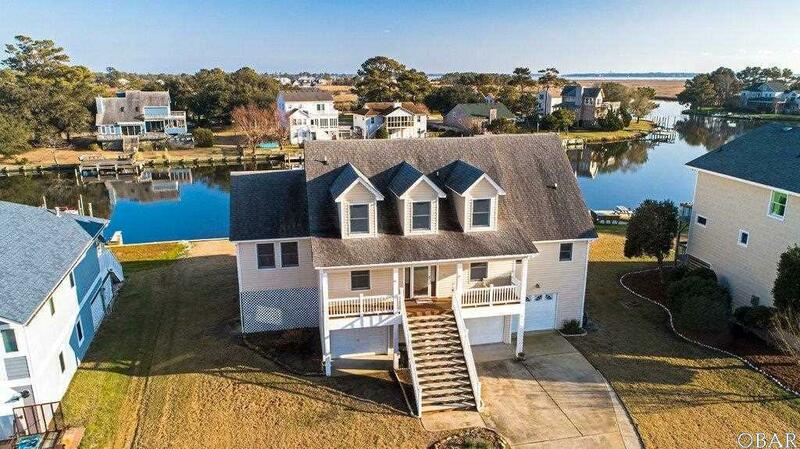 *** HOME FEATURES SPECTACULAR WATER VIEWS FROM ABOUT EVERY WINDOW ... SUNROOM, BEDROOMS, KITCHEN, AND YES, WATER VIEWS EVEN FROM THE WINDOW IN THE LAUNDRY ROOM! 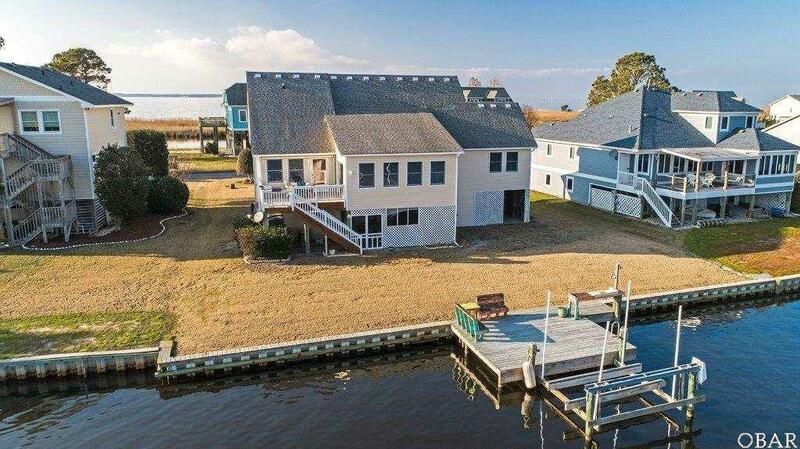 *** BUILT IN YEAR 2000 & IS WELL MAINTAINED INSIDE AND OUT *** LAND FEATURES 92 FEET ON WATER WITH NEW BULKHEAD IN 2014 * BOAT DOCK W/ POWER, AND BOAT LIFT, AND WITH FISH CLEANING STATION W/ TABLE/SINK * QUICK AND EASY MOTOR OUT TO THE CURRITUCK SOUND *INCREDIBLE WIDE CANAL VIEWS * YOU ARE VERY CLOSE TO THE POINT AND ACCESS TO THE SOUND * ENJOY BREATHTAKING SUNRISES ... AND SUNSETS ACROSS THE STREET TO THE WEST ... WHERE YOU WILL EXPERIENCE INCREDIBLE SUNSETS OVER WATER * OFTEN SUNSETS ARE FOLLOWED BY SOME OF THE MOST AMAZING COLORS IN THE SKY ... SOMETHING THAT WILL NEVER CEASE TO AMZE! IMAGINE COMING HOME TO ENJOY THIS EVERY DAY *** HOME FEATURES A WELL THOUGHT OUT DESIGN AND FLOORPLAN ... SELLERS DESIGNED AND HAD THIS HOME BUILT ATTENDING TO EVERY DETAIL AND IT SHOWS ... MAIN LIVING LEVEL 2 FEATURES SPACIOUS LIVING ROOM W/ HIGH CEILINGS, HARDWOOD FLOORING & GAS FIREPLACE * EAT-IN KITCHEN/DINING AREA WITH SOLID SURFACE COUNTER TOPS, COUNTER TOP RANGE, WALL OVEN, STAINLESS REFRIGERATOR (MOST KITCHEN APPLIANCES NEW IN 2017) , WALK-IN LAUNDRY ROOM W/ PANTRY CLOSET, GUEST BEDROOM OFF MAIN ENTRY HALLWAY, AND FULL BATH WHICH SERVES THE BEDROOM AND ALSO CONNECTS TO HALLWAY FOR GUEST USE * AT NORTH WING OF HOME ON THIS LEVEL IS A HUGE MASTER BEDROOM AND EXTRA LARGE WALK-IN CLOSET WITH DOUBLE DOORS & SPACE SAVER RACKS * RETURNING BACK TO LIVING ROOM AREA ... THE FOCAL POINT OF THE HOME IS THE SPACIOUS SUN/FLORIDA ROOM OFF OF THE LIVING ROOM - IT FEATURES WINDOWS GALORE WITH AMAZING CANAL VIEWS ... AND THIS WAS DESIGNED WITH INTERIOR MULTI-SECTIONAL SLIDING GLASS DOORS THAT FOLD INTO THE WALL ... PERFECT FOR SECTIONING OFF THAT SPACE IF YOU WANT, BUT WHEN LEFT OPEN CREATES A GENEROUS MAIN LIVING AREA WHERE YOU CAN ENJOY IT YOURSELVES OR HAVE PLENTY OF ROOM FOR GUESTS! *** LEVEL 3 FEATURES 2 ADDITIONAL BEDROOMS AND A FULL BATH AND SEVERAL STORAGE CLOSETS IN SURPRISING PLACES MAKING USE OF ALL AVAILABLE SPACES ... THE HALLWAY UPSTAIRS IS AN OPEN BANNISTER OVERLOOKING THE LIVING ROOM AND SUN ROOM ... YOU WILL LOVE IT! *** LEVEL 1 GROUND LEVEL ... INTERIOR STAIR LEADS DOWN TO HUGE GARAGE WITH 2 CAR BAYS, HUGE WORKSHOP IN REAR, BUILT-IN ELECTRICAL PANEL WITH HOOK UP TO GENERATOR (SOLD AS-IS) BUT IS POSITIONED FOR USE AND CONVEYS TO NEW OWNER! *** DOOR TO REAR LEADS TO SCREENED PORCH PATIO WITH OUTSIDE SHOWER AND SALT-WATER HOT TUB NEW IN 2013 * HUGE SPACE UNDER NORTH WING OF HOME IS OPEN BUT HAS SOME WALLED SPACE AND IS UNDER COVER AND CONCRETE FLOOR - SPACE FOR STORING GARDENING TOOLS, LUMBER, OR WHATEVER YOU WOULD LIKE - GREAT SPACE! *** ADDITIONAL UPDATES ... 1 HVAC SYSTEM CONDENSER NEW 2016, WATER HEATER NEW 2014, EXTRA CARPET (NEW) ENOUGH TO COVER STAIRS FOR LEVEL 2 TO LEVEL 3 * SELLER MAINTAINS ANNUAL CONTRACT WITH FOUR SEASONS PEST CRONTROL * COASTAL GAS HANDLES LP GAS * BRASS BAROMETER/CLOCK SET ON WALL IN SUN ROOM DO NOT CONVEY * ALL WALL HANGINGS (SCREWED IN OR ON HOOK) DO NOT CONVEY *** SELLER HAS SURVEY AND ELEVATION CERTIFICATE ... NOTE THAT SELLER DOES NOT CURRENTLY CARRY FLOOD INSURANCE - FLOOD INSURANCE POLICY PREMIUM COST WAS IN THE NORMAL RANGE *** KITTY HAWK LANDING IS A PRIVATE WATERFRONT COMMUNITY TUCKED AWAY FROM THE BUSYNESS OF THE BEACH AND YET CLOSE TO SHOPPING, RESTAURANTS, WRIGHT BROTHERS MONUMENT, THE BEACH (CHECK OUT THE KITTY HAWK LANDING ASSOCIATION PRIVATELY OWNED OCEANFRONT BEACH ACCESS! ), AND SO MUCH MORE *** COME SEE THIS BEAUTIFUL HOME ... YOU WILL LOVE IT! 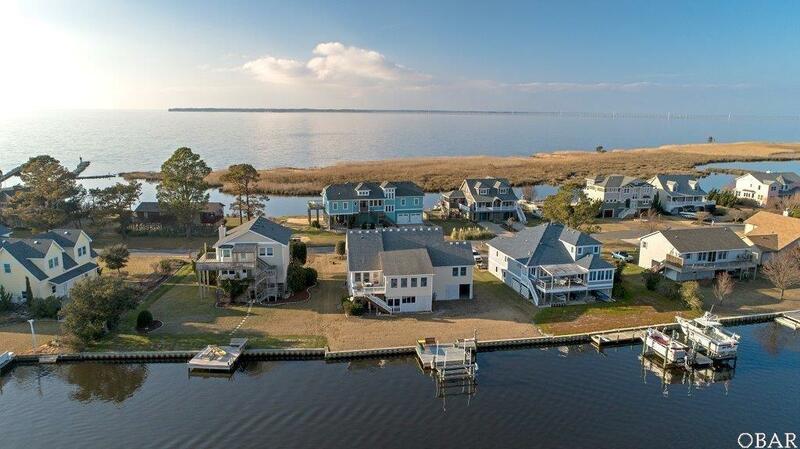 Listing courtesy of John Leatherwood of Coldwell Banker Seaside Realty.